Emotions run heavy in the workplace, but managing that emotion can make all the difference. The best advice we have is that having restraint in the moment will allow you to make better decisions and receive better information from people around you. J: Are you ready again? J: Nicole and I work here together with a great team at Shape.io headquarters in Bend, Oregon. Nicole runs our support and marketing and I'm lucky enough to be the CEO. N: Just to give you guys a little background. We left our agency jobs as marketers to build software for digital advertising teams. 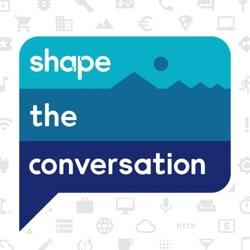 So we'll be talking about working in marketing and growing Shape on this podcast. J: Our goal is just to impart some advice from our experiences, talk through some of the tough lessons we've learned along the way, and give you some takeaways that you can hopefully use to shape your own conversations through the week. Why should you listen to us at all? Well we're a profitable software company outside of the Silicon Valley bubble. We raised seed funding in 2015 and have used that to grow the team and customer so we've had experiences kind of getting stuff off the ground and we're going to use that as the base for a lot of our podcast episodes already and going forward. N: So in this episode we'll be discussing "Balancing Your Emotions in the Workplace." N: Oh my... my head on the desk exhausted, infuriated moments. I think I might have mentioned this in a previous podcast but there were moments when I was not quite a manager yet when I was an analyst or a senior analyst and eventually you know you run into a client issue or something that you were hoping would work, a test, whatever that just doesn't work out how you intended. And so I would very visibly show my emotion by either pretty much banging my head down on my arm on my desk--I would never actually give myself a concussion--but just you know kind of be exhausted, exasperated head on the desk where I would stay for a couple moments gather my thoughts and come back up. J: Yeah definitely, that was known as the Nicole there. And you know just give Nicole a few minutes she'll be okay. But I think it's kind of topic falls into the category of just solid advice we'd give to the younger versions of ourselves. Ways that now we see maybe we could have handled some of those tougher situations better and just how generally maybe having a little bit more of a consistent middle, having you know less high highs and less low lows, can sort of help you sustain yourself in the workplace. It can make you somebody that other people also want to work with. So we've just kind of talking about it before on the podcast, Nicole and I were saying that it's not all good and you know it just remaining steady calm all the time isn't necessarily always a positive. You know there are some cons one of them is it can be frustrating to show restraint all the time. You know when you if you're getting frustrated with a co-worker or a client or something in that moment you know you have emotions you're feeling them not being able to really let them out and being restrained can be a tough thing to do. N: Now are you talking about this from just a manager position or are you talking about it from you know kind of just a general employee position as well? J: Well I think general employee position. I don't think you have to be in a position of leadership necessarily to see benefits from maintaining a little bit more calm during rougher times. One example I just saw recently a couple of nights ago in the NBA Finals. LeBron James is playing. It's a tied game, miss a free throw their team gets the rebound and the guy instead of going right back up with it J.R. Smith thinks they're ahead in the game dribbles the ball back out completely bonehead play and they don't get a shot off. They end up losing the game and LeBron in that moment looks a J.R. Smith and you can see him like so confused and then immediately understand he's a leader. There's millions of people watching how he's going to respond to this. He doesn't want throw his team member under a bus. You can see him like snap into like "OK I can't respond I can't just throw this guy under the bus. I can't you know yell at him right now." He ran over to him put his arm around him asked him what happened. It showed incredible restraint. Now I think that on a mini version you kind of have a lot of little mini versions of that in your workday. You know you get an e-mail that's maybe a little frustrating or you know you get some feedback you weren't expecting. You get surprised by something and maybe your defenses go up a little too quick and you start to fight back. But you know at the same time being really flat with your team or people or in your office that's not always the most inspiring thing to be around so thinking about what you share with your team when you share with your team when they get excited about something that that's another way to that I think I struggle with personally when I'm thinking about remaining calm in the work day like you want to get excited you want to show that you care about whatever you're working on and bouncing that I think is really tough. N: So you have to look for the opportune moments to share certain things with your team. There were times in my former agency role when I knew ahead of time either something great that was going to happen or something bad that was going to happen. Or not necessarily bad, but it was just going to have an impact on the team that I had to really think and prepare for how I was going to communicate that with them. Where would I show emotion (whether I wanted to be really happy or if I wanted to be really frustrated) I couldn't. Not that you necessarily always have to walk the company line, but you do have to understand that you know you're there to communicate that piece of information to the team in a way that they get to take that information and make their own decisions about it. So that's kind of my experience doing, balancing the emotions when I wanted to be really over-the-top either way. J: Yeah definitely. I'd say I've made the mistake before especially early on in startup days like you want to celebrate any win so hard you're like you're so eager to get a win even today. You know if we've got a really big prospect we're chasing down and we get like a pretty positive e-mail from them or some kind of verbal commitment immediately you want to like tell the team that it's good to go through but it's not done or you know you might get hopes up. You've got to balance those expectations sometimes until there's something really concrete they can get excited about. N: Yeah until the ink is on the contract in that case you can't get super excited and you can't go buying the new ping pong table or whatever it may be. Because if it doesn't happen I guarantee you that that is going to actually turn the morale of the team the other way more than it had if you just had maybe kept it to yourself or tempered that emotion initially. J: Yeah definitely. I think a lot of the pros about kind of staying a little bit more centered and calm through your day or just generally like having less regrets about how you acted in the moment because you're giving yourself a little bit extra time to really process something and gain perspective on something. I think generally you make better decisions to when you have that little bit of a waiting period. N: Absolutely. I mean you get some bad client news or some... I can't think of another example right, now...and immediately you want to jump in and respond either via e-mail to the customer or to your team and just be like this is what happened. But when you take a step back when you take a couple minutes when you maybe make a lap around the building things tend to connect or like click in a place where you can say maybe it's not the immediate problem that you thought it was. Maybe you just need to take a step back ask them some questions and will actually help resolve the issue faster. J: Yeah and I think with internal communication so other people on your team too it also is helpful if you... if they know you're going to remain calm or centered because you're more likely to get that information from them. You know if people know that you're gonna maybe flip out or overreact or really be like super emotional in the moment to some kind of bad piece of information it's probably more likely they're not going to share that with you. Bad information, especially if you're in a management or a decision-making role, is probably the best information and the most valuable information you need to make decisions. But if you've created this world where any kind of bad news comes your way and you're reacting in a way that makes somebody feel uncomfortable, they're going to be less likely to bring you that information. N: I think kind of a side note to that too is you tend to see those people who react really, really strongly like in a management role with a lot of emotion are also the people who tend to fling a lot of blame or not necessarily take blame on their own. Then they get known for that as well. And you get this really toxic environment on your team where not only is the manager having these emotions that are preventing him or her from getting the great information that they need to make the decisions that are positive for their team. But, they're also creating that environment for their teammates or their employees. You see that attitude dispersing out. It's really interesting how quickly negative attitude can spread across an organization just because of one bad apple. J: And you can trigger that you know negative spread a lot faster if you're also feeding it and reacting in the moment and you're part of it. And that's one thing to just be really aware of and have some kind of detachment from this information in the moment to give you that ability to take a step back and not sort of feed the paranoia. N: Well at the end of the day I mean it is information about your job. And yes we spend a huge portion of our lives at our job. But you know you have to take a step back and say I am a person outside of my job and the emotions, the physical emotions that I'm having to this news right now there are slightly... you know, we are not on a science podcast, but they're biological right. You know you may want to get upset. You may want to cry you may want to yell. You may want to have that physical reaction but that's... you have to kind of separate that the business side from the personal side and really remember that yes you're here to do a great job. But that moment, that e-mail, that conversation, that feedback that you get in the moment that you really just want to blow up at, is one moment. J: Yeah think you really need to have professionalism in a lot of cases. I think that's what it means to me it's not flying off the handle. It's being a part of the solution not exacerbating any problems that might be out there. N: Well and as I started the top of this with my example Jon made it really clear to me before he handed over the managerial reins that I could not show that level of emotion anymore because it would be toxic. It would impact the team and so I even over the span of two weeks, I had to sit there and go OK I need to step myself back. And I hope that I was able to take that emotion out of most of my interaction with my team just by remembering that. J: Definitely. If we look at a few examples that day-to-day we face here at Shape or that we think about here at Shape, I think one of them is that it's always... we're always presenting new ideas a new feature lay out a new UX or a new blog post idea and we'll pitch them out to the teams a lot of times. And I think when you're receiving feedback on something new, you're working on or tweaking something that can be really hard because it's something you put a lot of thought into. Now here's some person coming in and giving you feedback that just heard the idea three minutes ago and it's easy to get real emotional about that. So specifically one of the ways we do kind of new feature role out here at shape and Dominic Albano our V.P. of engineering, he's got a really interesting process that I like when he's rolling out new features. I think it really exemplifies this well in terms of managing your emotion. So Dominic will spend weeks maybe months sometimes on a new feature or something new to launch within the app and he gets into a phase to where it's finally ready to pitch it to the rest of our team. We have these product meetings where Dominic will get up. He'll talk about why he build this product, the goals of the product everything, and he'll set it up on staging. The whole team goes and tries it out and he launches a Google Doc where people are just pinging feedback into there or pinging feedback out loud to him. Some of it you know you can tell it is tough to hear right out of the gate like "oh I don't like this" or "I like this" or "where did this go?" or "I can't believe you'd change this." And he's just getting like pummeled with this stuff but you se him just sit there calmly take it calmly listening or editing it down on the Google Doc like he might have an answer for something or a question or a reason he did something or a rebuttal to the feedback. But he doesn't give it right there in that moment. And I'm always really impressed when we go through that and run through that exercise as a team how that kind of helps it be a positive environment. N: And I think he ultimately wants to make the best version of the product he possibly can. So he may be thinking "oh well you should know this" or "oh this should just be clear." In the moment, getting that feedback from us, being able to sit there and synthesize it, and then he may come back a day or two later to answer some of the questions or concerns we have. Ultimately he actually may continue with that same feature in the same state that it originally was but he addresses all of our concerns by taking a step back, formulating his thoughts, and coming back with all that list of feedback very methodically just like he presents it. J: Yeah that's something that I've tried to work more into my day-to-day is when presenting new ideas or trying to get feedback on something is trying to understand that that feedback is probably going be tough to hear. You know a lot of times and to be extra aware like extra prep yourself going into those times to remain calm. I think giving yourself a little pep talk when you're going into like a tough call or a tough situation. It sounds cheesy but it can help you know and identifying those situations that might earlier on can help you better handle them once you get in them. J: I called it the Mears score, the Nicole Mears score, for my blog posts. If I'm anywhere under 40 edits I'm actually feeling pretty good about myself. N: But that being said, I know you see that progression. You see that improvement over time. And you know--I know we're kind of devolving you, know moving away from balancing your emotions--but you actually take that criticism very well and you have become a better writer. I'm not saying that's because of my editing skills. J: No I think that is part of it. Writing is a lot about getting the feedback and if you haven't communicated your point across to somebody clearly then that's on you. And that's what's really changed my view of writing is less so much thinking about like why can't you understand what I'm saying this brilliant point more understanding like oh man they didn't get it. That's a reflection on me in my writing. And that's another area sort of like thinking about someone is a reflection of you are like a "you" problem or "we "problem is another way to kind of prep yourself if you have to do any customer support with your job. Or working with clients and customers where you got to talk them through how to do something you know we've got some features within our software that take a little extra setup than others and sometimes we've got to help people through it and talk them through it. And it's easy sometimes to maybe get frustrated with somebody not understanding how to do something but you've got to take a step back and realize in our case here like we're spending every day all day with the software. We get it. We have to take a step back and try to put ourselves in the shoes of somebody, a lot of times seeing it for the very first time. N: Break something. Hack around it to meet their needs. And that's all kind of it's part of the process. But you know realizing again that that it's a problem that we need to address for the betterment of everybody. It helps me to step back and when I'm getting you know 10 tickets at once are the same issue go, OK it's not our customers. It's something that we need to really think deeper about. J: Yeah. And I think remaining calm or keeping that level also helps as that like ninth or tenth ticket maybe comes through because you're realizing that okay that this person doesn't understand that maybe you've gotten eight other tickets that day (or maybe one of those tickets was speeding ticket on your way into work) and that has you at a heightened state of agitation for that day. A lot of those things--being aware of those types of things--and where your hiccups might be along that day, can kind of help you remain calm and you know handle that tenth ticket the same way you did the first ticket. Whereas if you're living and dying with everything, sometimes you just might not be able to rally for that you know tenth same action you might have to take in that day. If you're so just in the moment with every single ticket or action and living it's so hard. N: All right Jon I've got some bad news for you. N: I'm going to have to calmly wrap this show up. N: But let's talk some takeaways before we head out. J: I can handle that. I'm ok with this. N: So I think a big takeaway from for me is really having that restraint in the moment is going to give you time to make better decisions. Your highs aren't going to be so high, lows aren't going to be so low. In general you actually can be a more fun person to be around because people are going to trust that you can balance and temper the good news with the bad. And really, you know whether you're in a management position, whether you're an analyst, whether you're a leader of a company, you're going to make the right decisions. That being said you don't always have to be a robot. You don't have to monotone everything. That's not going to help either. So just be cognizant of what you're thinking and how you present it. J: Okay I've come to grips with the fact that this episodes over so you can find show notes and the links to our e-mails, any link to social networks that you need, and the show notes here. And we hope you'll subscribe and review. We're still getting started so tell a friend about too that really helps. And I look forward to talking to you guys next week. N: Thanks so much for listening. Over and out. J: from Bend Oregon and Shape HQ.